“I want you to write a travel blog piece for Schacht.” Ben said. “What do you mean?” starting to back away from Ben’s desk. Laughing hysterically I walked away, a little flattered and completely intimidated by the amount of work to accomplish such a project. Hmm… weave or spin something inspired by travel. My mind began to spin thoughts of Central Asia. The “STANS” were on my radar because I had been asked to go to Tajikistan and Uzbekistan recently. I fell into my obsession with Central Asia honestly. I was, as often is the case, looking for something to read that would transport me through travel to some other life. Perusing the shelves of a local bookstore I found just the ticket, Shadow of the Silk Road by Colin Thubron (Chatto and Windus) 2006. I spent time traveling through China to all the “STAN’S” (Kirghizstan, Tajikistan, Kazakhstan, Afghanistan, Turkmenistan, and Uzbekistan) all the while remaining firmly at home in Boulder, Colorado. An elaborately cross stitched skull cap possibly of Uzbek origin caused me to become enamored with looking at textiles from the region, which of course landed me with another book, Traditional Textiles of Central Asia by Janet Harvey (Thames and Hudson) 1997 bringing a world of beautiful textiles to my fingertips. My mind flashed upon the beautiful abr silk cloth used for clothing in rural Central Asia. I could do a weaving! Yeah…NO! Then I thought of the sumptuous embroidery, I can actually, mmm…sort of embroider. Well, okay I only know one stitch. I don’t really spin or weave, so I was a bit perplexed. Eventually, I came up with a plan. I needed to weave some part, since as Ben put it. “We are a spinning and weaving company!” I could weave a ground for embroidery! Zoom Loom! Four inches by four inches I didn’t want to overcommit! I can make a “lali-posh”. 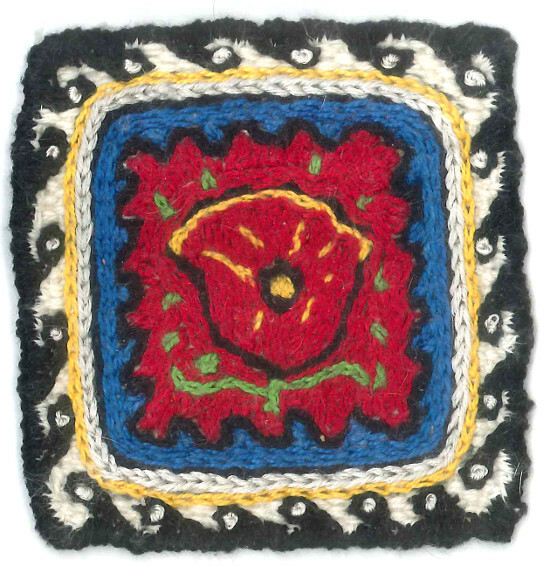 A small square embroidered as a cover for sweets in the Uzbek, Tadjik, and Sart cultures. The “lali-posh” is a dowry gift from the bride to the groom. Well, that didn’t exactly work for me, but the concept was perfect for a small textile I could actually accomplish. I would weave the ground in cotton. Since my project was only a 4” x 4” square I chose a single Tulip surrounded in black with a traditional free flowing plant based design. Black and red are often pervasive in Uzbek designs, with beautiful blues, yellows, and greens highlighting the designs. Tulips are a highly stylized symbol, pervasive in Central Asian textiles, representing fertility. The common geography and climate create similarities between Colorado and Central Asia, leaving me with an affinity for the tulip also. This project was about to put my weaving skills to the test. 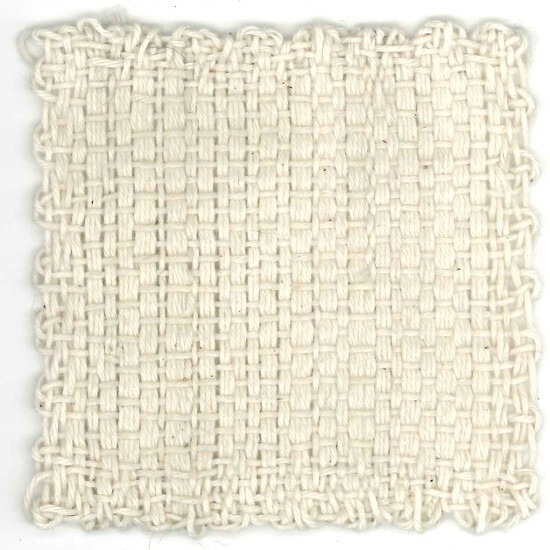 Complicated weave structures completely baffle me, I had to take a remedial weaving class, so with plain weave I figured I would be able to manage. HAHAHAHA! First came the issue of warping the Zoom Loom, the cotton I was using was a 10/2 we use for spinning wheel drive cords. I tried using the normal “Three-layer Warp Thread Setup” which didn’t work out. The sett was all wrong based on my yarn. I had to fill the warp with too many weft threads, which became overly complicated and an inadequate ground for embroidery. Although the finished piece had a nice hand it was time to start over. It was then that the next book magically appeared between Denise and Ben’s desks. I leafed through it, and discovered the answer to conquer the sett issue on pp. 38-39: “Two-Layer Warp Thread Setup.” 100 Pin Loom Squares by Florencia Campos Correa (St. Martin’s Griffin) 2015 “The loom is threaded vertically in two layers of parallel threads before it is woven horizontally.” This way of warping the Zoom Loom creates an even structure to embroider upon. The Zoom Loom makes a very respectable embroidery hoop if flipped over, the weaving is framed quite nicely. Although embroidery is time consuming it served to soothe my soul during a particularly difficult time in my life. Perhaps the “lali-posh” soothes the bride to be while awaiting marriage. I drew out my design so I wouldn’t forget what it should look like. Choosing blue for what often might be black, purely based on my preference. The chain stitch is heavily used in Central Asia, so it was time to learn. My grandmother had not gotten this far with my education in the domestic arts. Fortunately, we have YouTube. A couple minutes viewing the video and I had it down. Funny how the “domestic arts” are more appealing at fifty-six than at ten years of age. My dignity as a “tomboy” was no longer at stake. I could even learn to do a French knot through YouTube which I used in the border to highlight the running dog design. The pins on the pin loom often catch the embroidery thread leaving loops. Manage this by placing tape over the pins so the embroidery thread is not constantly being caught. A friend mentioned this idea when I had finished most of the piece. Oh well! When I had completely embroidered the framed space, I needed to remove it from the Zoom Loom. I wasn’t sure that the non-embroidered woven part would maintain its structural integrity because of the warp setup style I had used. My solution was to catch each stitch around the pins so that the selvedge would remain intact. This worked well. Allowing me to ease the piece off the loom. The stiffness of the embroidered area supported the non-embroidered edge until it could be finished. I bound the edge in a black running dog which frames the tulip. I used the French knot to finish off the interior dot as a simple embellishment. I am pleased with the finished piece. I just need to find a wonderful sweet to put under it, hmm, maybe a tiny slice of Double Chocolate Espresso Gluten Free Cake I had for my birthday would work. Sitting here daydreaming about traveling adventures in the “STANS” looking forward to my reward for hard “WORK” under the lali-posh. Cindy is the quality manager at Schacht Spindle Company, keeping our standards high. When Cindy isn’t maintaining quality at Schacht, she is hard at work as the President of WARP. You can find Cindy in the DVD “Know Your Wheel” where she shares her extensive knowledge of spinning wheels.